Systems theory is the interdisciplinary study of systems. A system is a cohesive conglomeration of interrelated and interdependent parts that is either natural or man-made. Every system is delineated by its spatial and temporal boundaries, surrounded and influenced by its environment, described by its structure and purpose or nature and expressed in its functioning. In terms of its effects, a system can be more than the sum of its parts if it expresses synergy or emergent behavior. Changing one part of the system usually affects other parts and the whole system, with predictable patterns of behavior. For systems that are self-learning and self-adapting, the positive growth and adaptation depend upon how well the system is adjusted with its environment. Some systems function mainly to support other systems by aiding in the maintenance of the other system to prevent failure. The goal of systems theory is systematically discovering a system's dynamics, constraints, conditions and elucidating principles (purpose, measure, methods, tools, etc.) that can be discerned and applied to systems at every level of nesting, and in every field for achieving optimized equifinality. General systems theory is about broadly applicable concepts and principles, as opposed to concepts and principles applicable to one domain of knowledge. It distinguishes dynamic or active systems from static or passive systems. Active systems are activity structures or components that interact in behaviours and processes. Passive systems are structures and components that are being processed. E.g. a program is passive when it is a disc file and active when it runs in memory. The field is related to systems thinking and systems engineering. System: An organized entity made up of interrelated and interdependent parts. Boundaries: Barriers that define a system and distinguish it from other systems in the environment. Homeostasis: The tendency of a system to be resilient towards external factors and maintain its key characteristics. Adaptation: The tendency of a self-adapting system to make the internal changes needed to protect itself and keep fulfilling its purpose. Reciprocal Transactions: Circular or cyclical interactions that systems engage in such that they influence one another. Feedback Loop: The process by which systems self-correct based on reactions from other systems in the environment. Throughput: Rate of energy transfer between the system and its environment during the time it is functioning. Microsystem: The system closest to the client. Mesosystem: Relationships among the systems in an environment. Exosystem: A relationship between two systems that has an indirect effect on a third system. Macrosystem: A larger system that influences clients, such as policies, administration of entitlement programs, and culture. Chronosystem: A system composed of significant life events that can affect adaptation. The term "general systems theory" originates from Bertalanffy's general systems theory (GST). His ideas were adopted by others including Kenneth E. Boulding, William Ross Ashby and Anatol Rapoport working in mathematics, psychology, biology, game theory and social network analysis. Sociological systems thinking started earlier, in the 19th century. Stichweh states: "... Since its beginnings the social sciences were an important part of the establishment of systems theory... the two most influential suggestions were the comprehensive sociological versions of systems theory which were proposed by Talcott Parsons since the 1950s and by Niklas Luhmann since the 1970s." References include Parsons' action theory and Luhmann's social systems theory. Contemporary ideas from systems theory have grown with diverse areas, exemplified by the work of biologist Ludwig von Bertalanffy, linguist Béla H. Bánáthy, sociologist Talcott Parsons, ecological systems with Howard T. Odum, Eugene Odum and Fritjof Capra, organizational theory and management with individuals such as Peter Senge, interdisciplinary study with areas like Human Resource Development from the work of Richard A. Swanson, and insights from educators such as Debora Hammond and Alfonso Montuori. As a transdisciplinary, interdisciplinary and multiperspectival domain, the area brings together principles and concepts from ontology, philosophy of science, physics, computer science, biology and engineering as well as geography, sociology, political science, psychotherapy (within family systems therapy) and economics among others. Systems theory thus serves as a bridge for interdisciplinary dialogue between autonomous areas of study as well as within the area of systems science itself. In this respect, with the possibility of misinterpretations, von Bertalanffy believed a general theory of systems "should be an important regulative device in science", to guard against superficial analogies that "are useless in science and harmful in their practical consequences". Others remain closer to the direct systems concepts developed by the original theorists. For example, Ilya Prigogine, of the Center for Complex Quantum Systems at the University of Texas, Austin, has studied emergent properties, suggesting that they offer analogues for living systems. The theories of autopoiesis of Francisco Varela and Humberto Maturana represent further developments in this field. Important names in contemporary systems science include Russell Ackoff, Ruzena Bajcsy, Béla H. Bánáthy, Gregory Bateson, Anthony Stafford Beer, Peter Checkland, Barbara Grosz, Brian Wilson, Robert L. Flood, Allenna Leonard, Radhika Nagpal, Fritjof Capra, Warren McCulloch, Kathleen Carley, Michael C. Jackson, Katia Sycara, and Edgar Morin among others. It (General System Theory) was criticized as pseudoscience and said to be nothing more than an admonishment to attend to things in a holistic way. Such criticisms would have lost their point had it been recognized that von Bertalanffy's general system theory is a perspective or paradigm, and that such basic conceptual frameworks play a key role in the development of exact scientific theory. .. Allgemeine Systemtheorie is not directly consistent with an interpretation often put on 'general system theory,' to wit, that it is a (scientific) "theory of general systems." To criticize it as such is to shoot at straw men. Von Bertalanffy opened up something much broader and of much greater significance than a single theory (which, as we now know, can always be falsified and has usually an ephemeral existence): he created a new paradigm for the development of theories. "Theorie" (or "Lehre"), just as "Wissenschaft" (translated Scholarship), "has a much broader meaning in German than the closest English words 'theory' and 'science'". These ideas refer to an organized body of knowledge and "any systematically presented set of concepts, whether empirically, axiomatically, or philosophically" represented, while many associate "Lehre" with theory and science in the etymology of general systems, though it also does not translate from the German very well; its "closest equivalent" translates as "teaching", but "sounds dogmatic and off the mark". While the idea of a "general systems theory" might have lost many of its root meanings in the translation, by defining a new way of thinking about science and scientific paradigms, Systems theory became a widespread term used for instance to describe the interdependence of relationships created in organizations. The systems view is a world-view that is based on the discipline of SYSTEM INQUIRY. Central to systems inquiry is the concept of SYSTEM. In the most general sense, system means a configuration of parts connected and joined together by a web of relationships. The Primer Group defines system as a family of relationships among the members acting as a whole. Von Bertalanffy defined system as "elements in standing relationship." Similar ideas are found in learning theories that developed from the same fundamental concepts, emphasising how understanding results from knowing concepts both in part and as a whole. In fact, Bertalanffy's organismic psychology paralleled the learning theory of Jean Piaget. Some consider interdisciplinary perspectives critical in breaking away from industrial age models and thinking, wherein history represents history and math represents math, while the arts and sciences specialization remain separate and many treat teaching as behaviorist conditioning. The contemporary work of Peter Senge provides detailed discussion of the commonplace critique of educational systems grounded in conventional assumptions about learning, including the problems with fragmented knowledge and lack of holistic learning from the "machine-age thinking" that became a "model of school separated from daily life". In this way some systems theorists attempt to provide alternatives to, and evolved ideation from orthodox theories which have grounds in classical assumptions, including individuals such as Max Weber and Émile Durkheim in sociology and Frederick Winslow Taylor in scientific management. The theorists sought holistic methods by developing systems concepts that could integrate with different areas. Some may view the contradiction of reductionism in conventional theory (which has as its subject a single part) as simply an example of changing assumptions. The emphasis with systems theory shifts from parts to the organization of parts, recognizing interactions of the parts as not static and constant but dynamic processes. Some questioned the conventional closed systems with the development of open systems perspectives. The shift originated from absolute and universal authoritative principles and knowledge to relative and general conceptual and perceptual knowledge and still remains in the tradition of theorists that sought to provide means to organize human life. In other words, theorists rethought the preceding history of ideas; they did not lose them. Mechanistic thinking was particularly critiqued, especially the industrial-age mechanistic metaphor for the mind from interpretations of Newtonian mechanics by Enlightenment philosophers and later psychologists that laid the foundations of modern organizational theory and management by the late 19th century. System dynamics is an approach to understanding the nonlinear behaviour of complex systems over time using stocks, flows, internal feedback loops, and time delays. Systems biology is a movement that draws on several trends in bioscience research. Proponents describe systems biology as a biology-based inter-disciplinary study field that focuses on complex interactions in biological systems, claiming that it uses a new perspective (holism instead of reduction). Particularly from the year 2000 onwards, the biosciences use the term widely and in a variety of contexts. An often stated ambition of systems biology is the modelling and discovery of emergent properties which represents properties of a system whose theoretical description requires the only possible useful techniques to fall under the remit of systems biology. It is thought that Ludwig von Bertalanffy may have created the term systems biology in 1928. Systems engineering is an interdisciplinary approach and means for enabling the realisation and deployment of successful systems. It can be viewed as the application of engineering techniques to the engineering of systems, as well as the application of a systems approach to engineering efforts. Systems engineering integrates other disciplines and specialty groups into a team effort, forming a structured development process that proceeds from concept to production to operation and disposal. Systems engineering considers both the business and the technical needs of all customers, with the goal of providing a quality product that meets the user's needs. Systems psychology is a branch of psychology that studies human behaviour and experience in complex systems. It received inspiration from systems theory and systems thinking, as well as the basics of theoretical work from Roger Barker, Gregory Bateson, Humberto Maturana and others. It makes an approach in psychology in which groups and individuals receive consideration as systems in homeostasis. Systems psychology "includes the domain of engineering psychology, but in addition seems more concerned with societal systems and with the study of motivational, affective, cognitive and group behavior that holds the name engineering psychology." In systems psychology, "characteristics of organizational behaviour, for example individual needs, rewards, expectations, and attributes of the people interacting with the systems, considers this process in order to create an effective system". 1954 Ludwig von Bertalanffy, Anatol Rapoport, Ralph W. Gerard, Kenneth Boulding establish Society for the Advancement of General Systems Theory, in 1956 renamed to Society for General Systems Research. 1977 Ilya Prigogine received the Nobel Prize for his works on self-organization, conciliating important systems theory concepts with system thermodynamics. Whether considering the first systems of written communication with Sumerian cuneiform to Mayan numerals, or the feats of engineering with the Egyptian pyramids, systems thinking can date back to antiquity. Differentiated from Western rationalist traditions of philosophy, C. West Churchman often identified with the I Ching as a systems approach sharing a frame of reference similar to pre-Socratic philosophy and Heraclitus. Von Bertalanffy traced systems concepts to the philosophy of G.W. Leibniz and Nicholas of Cusa's coincidentia oppositorum. While modern systems can seem considerably more complicated, today's systems may embed themselves in history. Figures like James Joule and Sadi Carnot represent an important step to introduce the systems approach into the (rationalist) hard sciences of the 19th century, also known as the energy transformation. Then, the thermodynamics of this century, by Rudolf Clausius, Josiah Gibbs and others, established the system reference model as a formal scientific object. The Society for General Systems Research specifically catalyzed systems theory as an area of study, which developed following the World Wars from the work of Ludwig von Bertalanffy, Anatol Rapoport, Kenneth E. Boulding, William Ross Ashby, Margaret Mead, Gregory Bateson, C. West Churchman and others in the 1950s, had specifically catalyzed by collaboration in. Cognizant of advances in science that questioned classical assumptions in the organizational sciences, Bertalanffy's idea to develop a theory of systems began as early as the interwar period, publishing "An Outline for General Systems Theory" in the British Journal for the Philosophy of Science, Vol 1, No. 2, by 1950. Where assumptions in Western science from Greek thought with Plato and Aristotle to Newton's Principia have historically influenced all areas from the hard to social sciences (see David Easton's seminal development of the "political system" as an analytical construct), the original theorists explored the implications of twentieth century advances in terms of systems. People have studied subjects like complexity, self-organization, connectionism and adaptive systems in the 1940s and 1950s. In fields like cybernetics, researchers such as Norbert Wiener, William Ross Ashby, John von Neumann and Heinz von Foerster, examined complex systems mathematically. John von Neumann discovered cellular automata and self-reproducing systems, again with only pencil and paper. Aleksandr Lyapunov and Jules Henri Poincaré worked on the foundations of chaos theory without any computer at all. At the same time Howard T. Odum, known as a radiation ecologist, recognized that the study of general systems required a language that could depict energetics, thermodynamics and kinetics at any system scale. Odum developed a general system, or universal language, based on the circuit language of electronics, to fulfill this role, known as the Energy Systems Language. Between 1929-1951, Robert Maynard Hutchins at the University of Chicago had undertaken efforts to encourage innovation and interdisciplinary research in the social sciences, aided by the Ford Foundation with the interdisciplinary Division of the Social Sciences established in 1931. Numerous scholars had actively engaged in these ideas before (Tectology by Alexander Bogdanov, published in 1912-1917, is a remarkable example), but in 1937, von Bertalanffy presented the general theory of systems at a conference at the University of Chicago. The systems view was based on several fundamental ideas. First, all phenomena can be viewed as a web of relationships among elements, or a system. Second, all systems, whether electrical, biological, or social, have common patterns, behaviors, and properties that the observer can analyze and use to develop greater insight into the behavior of complex phenomena and to move closer toward a unity of the sciences. System philosophy, methodology and application are complementary to this science. By 1956, theorists established the Society for General Systems Research, which they renamed the International Society for Systems Science in 1988. The Cold War affected the research project for systems theory in ways that sorely disappointed many of the seminal theorists. Some began to recognize that theories defined in association with systems theory had deviated from the initial General Systems Theory (GST) view. The economist Kenneth Boulding, an early researcher in systems theory, had concerns over the manipulation of systems concepts. Boulding concluded from the effects of the Cold War that abuses of power always prove consequential and that systems theory might address such issues. Since the end of the Cold War, a renewed interest in systems theory emerged, combined with efforts to strengthen an ethical view on the subject. Many early systems theorists aimed at finding a general systems theory that could explain all systems in all fields of science. The term goes back to Bertalanffy's book titled "General System theory: Foundations, Development, Applications" from 1968. He developed the "allgemeine Systemlehre" (general systems theory) first via lectures beginning in 1937 and then via publications beginning in 1946. Thus when von Bertalanffy spoke of Allgemeine Systemtheorie it was consistent with his view that he was proposing a new perspective, a new way of doing science. It was not directly consistent with an interpretation often put on "general system theory", to wit, that it is a (scientific) "theory of general systems." To criticize it as such is to shoot at straw men. Von Bertalanffy opened up something much broader and of much greater significance than a single theory (which, as we now know, can always be falsified and has usually an ephemeral existence): he created a new paradigm for the development of theories. These operate in a recursive relationship, he explained. Integrating Philosophy and Theory as Knowledge, and Method and Application as action, Systems Inquiry then is knowledgeable action. Cybernetics is the study of the communication and control of regulatory feedback both in living and lifeless systems (organisms, organizations, machines), and in combinations of those. Its focus is how anything (digital, mechanical or biological) controls its behavior, processes information, reacts to information, and changes or can be changed to better accomplish those three primary tasks. The terms "systems theory" and "cybernetics" have been widely used as synonyms. Some authors use the term cybernetic systems to denote a proper subset of the class of general systems, namely those systems that include feedback loops. However Gordon Pask's differences of eternal interacting actor loops (that produce finite products) makes general systems a proper subset of cybernetics. According to Jackson (2000), von Bertalanffy promoted an embryonic form of general system theory (GST) as early as the 1920s and 1930s but it was not until the early 1950s it became more widely known in scientific circles. Threads of cybernetics began in the late 1800s that led toward the publishing of seminal works (e.g., Wiener's Cybernetics in 1948 and von Bertalanffy's General Systems Theory in 1968). Cybernetics arose more from engineering fields and GST from biology. If anything it appears that although the two probably mutually influenced each other, cybernetics had the greater influence. Von Bertalanffy (1969) specifically makes the point of distinguishing between the areas in noting the influence of cybernetics: "Systems theory is frequently identified with cybernetics and control theory. This again is incorrect. Cybernetics as the theory of control mechanisms in technology and nature is founded on the concepts of information and feedback, but as part of a general theory of systems;" then reiterates: "the model is of wide application but should not be identified with 'systems theory' in general", and that "warning is necessary against its incautious expansion to fields for which its concepts are not made." (17-23). Jackson (2000) also claims von Bertalanffy was informed by Alexander Bogdanov's three volume Tectology that was published in Russia between 1912 and 1917, and was translated into German in 1928. He also states it is clear to Gorelik (1975) that the "conceptual part" of general system theory (GST) had first been put in place by Bogdanov. The similar position is held by Mattessich (1978) and Capra (1996). Ludwig von Bertalanffy never even mentioned Bogdanov in his works, which Capra (1996) finds "surprising". Cybernetics, catastrophe theory, chaos theory and complexity theory have the common goal to explain complex systems that consist of a large number of mutually interacting and interrelated parts in terms of those interactions. Cellular automata (CA), neural networks (NN), artificial intelligence (AI), and artificial life (ALife) are related fields, but they do not try to describe general (universal) complex (singular) systems. The best context to compare the different "C"-Theories about complex systems is historical, which emphasizes different tools and methodologies, from pure mathematics in the beginning to pure computer science now. Since the beginning of chaos theory when Edward Lorenz accidentally discovered a strange attractor with his computer, computers have become an indispensable source of information. One could not imagine the study of complex systems without the use of computers today. Complex adaptive systems (CAS) are special cases of complex systems. They are complex in that they are diverse and composed of multiple, interconnected elements; they are adaptive in that they have the capacity to change and learn from experience. In contrast to control systems in which negative feedback dampens and reverses disequilibria, CAS are often subject to positive feedback, which magnifies and perpetuates changes, converting local irregularities into global features. Another mechanism, Dual-phase evolution arises when connections between elements repeatedly change, shifting the system between phases of variation and selection that reshape the system. Differently from Beer Management Cybernetics, Cultural Agency Theory (CAT) provides a modelling approach to explore predefined contexts and can be adapted to reflect those contexts. 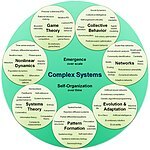 The term complex adaptive system was coined at the interdisciplinary Santa Fe Institute (SFI), by John H. Holland, Murray Gell-Mann and others. An alternative conception of complex adaptive (and learning) systems, methodologically at the interface between natural and social science, has been presented by Kristo Ivanov in terms of hypersystems. This concept intends to offer a theoretical basis for understanding and implementing participation of "users", decisions makers, designers and affected actors, in the development or maintenance of self-learning systems. ^ Beven, K. (2006). A manifesto for the equifinality thesis. Journal of hydrology, 320(1), 18-36. ^ Paolo Rocchi (2000). Technology + Culture. IOS Press. ISBN 978-1-58603-035-3. ^ Bertrand Badie et al. (eds. ), International Encyclopedia of Political Science. Sage New York. ^ Rudolf Stichweh (2011) "Systems Theory", in:y. ^ Luhmann, Niklas (1984). Soziale Systeme: Grundriß einer allgemeinen Theorie. Suhrkamp. ^ Shugart, Herman H., and Robert V. O'Neill. "Systems Ecology". Dowden, Hutchingon & Ross, 1979. ^ Van Dyne, George M. "Ecosystems, Systems Ecology, and Systems Ecologists". ORNL- 3975. Oak Ridge National Laboratory, Oak Ridge, TN, 1966. ^ Wilkinson, David M. (2006). Fundamental Processes in Ecology: An Earth Systems Approach. Oxford University Press. ^ Lester R. Bittel and Muriel Albers Bittel (1978), Encyclopedia of Professional Management, McGraw-Hill, ISBN 0-07-005478-9, p.498. ^ Michael M. Behrmann (1984), Handbook of Microcomputers in Special Education. College Hill Press. ISBN 0-933014-35-X. Page 212. ^ Parsons, Talcott (1951). The Social System. Glencoe. ^ Karl Ludwig von Bertalanffy: ... aber vom Menschen wissen wir nichts, (English title: Robots, Men and Minds), translated by Dr. Hans-Joachim Flechtner. page 115. Econ Verlag GmbH (1970), Düsseldorf, Wien. 1st edition. ^ Ivanov, K. (1993). Hypersystems: A base for specification of computer-supported self-learning social systems. In C. M. Reigeluth, B. H. Banathy, & J. R. Olson (Ed. ), Comprehensive systems design: A new educational technology (pp. 381-407). New York: Springer-Verlag. (NATO ASI Series F: Computer and Systems Sciences, Vol 95.) Original research report. William Ross Ashby (1956). An Introduction to Cybernetics. Chapman & Hall. William Ross Ashby (1960). Design for a Brain: The Origin of Adaptive Behavior - 2nd Edition. Chapman & Hall. Gregory Bateson (1972). Steps to an Ecology of Mind: Collected essays in Anthropology, Psychiatry, Evolution, and Epistemology. University of Chicago Press. Arthur Burks (1970). Essays on Cellular Automata. University of Illinois Press. Colin Cherry (1957). On Human Communication: A Review, a Survey, and a Criticism. The MIT Press. C. West Churchman (1971). The Design of Inquiring Systems: Basic Concepts of Systems and Organizations. New York: Basic Books. Peter Checkland (1999) Systems Thinking, Systems Practice: Includes a 30-Year Retrospective. Wiley. James Gleick (1997). Chaos: Making a New Science, Random House. John H. Holland (1992). Adaptation in Natural and Artificial Systems: An Introductory Analysis with Applications to Biology, Control, and Artificial Intelligence, The MIT Press. Niklas Luhmann (2013). Introduction to Systems Theory, Polity. Humberto Maturana and Francisco Varela (1980). Autopoiesis and Cognition: The Realization of the Living. Springer Science & Business Media. James Grier Miller (1978). Living Systems. Mcgraw-Hill. John von Neumann (1951) "The General and Logical Theory of Automata." Cerebral Mechanisms in Behavior, 1-41. John von Neumann (1956) "Probabilistic Logics and the Synthesis of Reliable Organisms from Unreliable Components." Automata Studies, 34, 43-98. John von Neumann and Arthur Burks (editor) (1966). Theory of Self-Reproducing Automata. Illinois University Press. Talcott Parsons (1951). The Social System. The Free Press. Ilya Prigogine (1980). From Being to Becoming: Time and Complexity in the Physical Sciences. W H Freeman & Co.
Herbert A. Simon (1996). The Sciences of the Artificial - 3rd Edition. Vol. 136 The MIT Press. Herbert A. Simon (1962). "The Architecture of Complexity." Proceedings of the American Philosophical Society. 106. Claude Shannon and Warren Weaver (1971). The Mathematical Theory of Communication. University of Illinois Press. René Thom (1972). Structural Stability and Morphogenesis: An Outline of a General Theory of Models. Reading, Massachusetts. Warren Weaver (1948) "Science and Complexity." The American Scientist. 536-544. Norbert Wiener (1965). Cybernetics, Second Edition: or the Control and Communication in the Animal and the Machine. Cambridge: The MIT Press. Lofti Zadeh (1962). "From Circuit Theory to System Theory." Proceedings of the IRE, 50(5), 856-865. This page was last edited on 4 April 2019, at 01:51 (UTC).